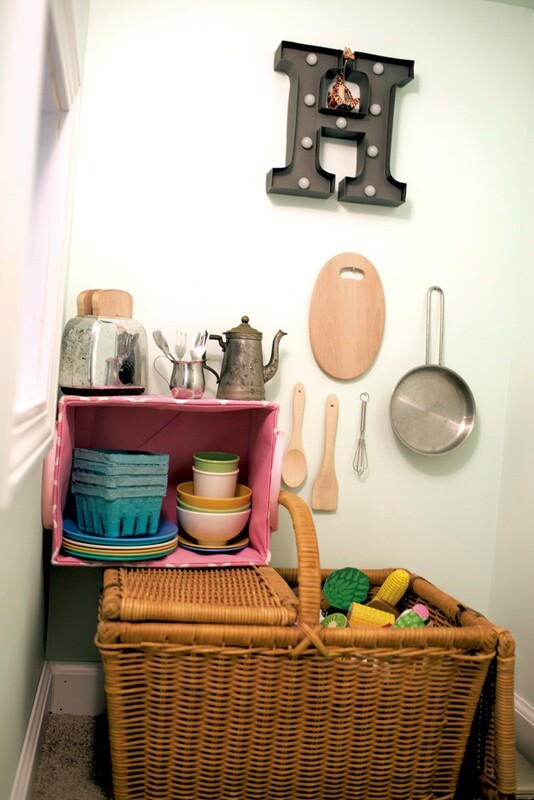 Basement Playhouse | Habitat | Kids VT - small people, big ideas! When Hatley turned 1, her parents, Meghan and Josh Dishaw of Middlebury, wanted to mark the occasion with an enduring gift that would encourage her imagination. So they decided to build her a special play space. Their plans quickly evolved beyond a simple nook. 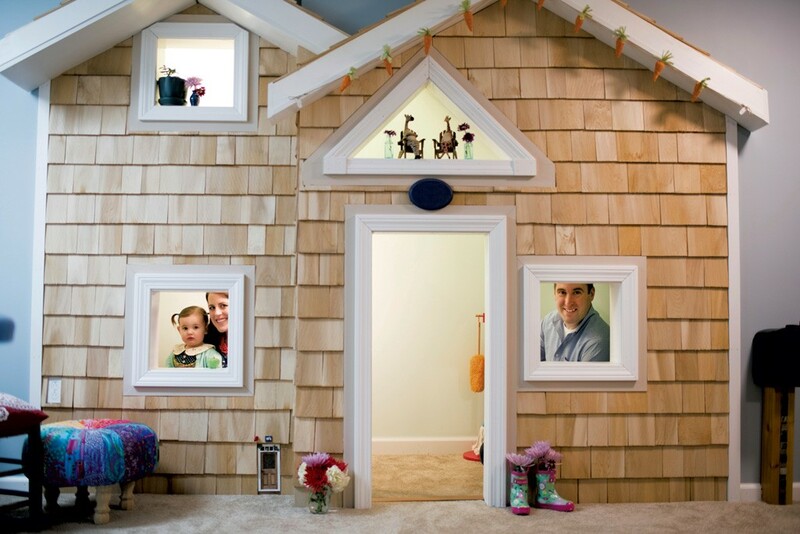 Together they constructed an elaborate playhouse in the space beneath their basement stairs. Meghan used blue tape to map out a floor plan, then explained her vision to her husband. An adept woodworker, Josh constructed standard two-by-four stud walls, "just like building any walls inside your house," he explained. He covered the interior walls with sheet rock and nontoxic paint, and affixed eastern white cedar shingles — free from harmful oils and dyes — to the exterior walls. Electrical wiring within the wall powers an interior light switch placed low enough for young children to reach. Decorative windows and a front door embellished with ornamental molding and trim give the playhouse a finished look. The couple used carpet remnants they had on hand to cover the floor. The finished space is roughly four feet wide and about 12 feet long. 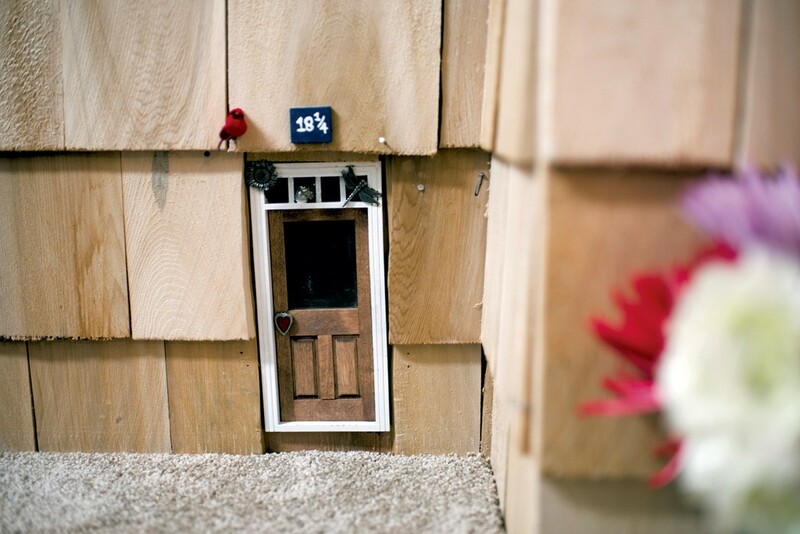 A small fairy door and house numbers that play on the family's actual address — 18 1/2 for the playhouse and 18 1/4 for the fairy door — add a whimsical touch. Now 19 months, Hatley has a fun place to read, snuggle and get creative. She loves to play grocery store through the playhouse window. Her parents hand her money in exchange for play food. "In that one game, she's learning to name food, to recognize colors of the food and counting," said Meghan. 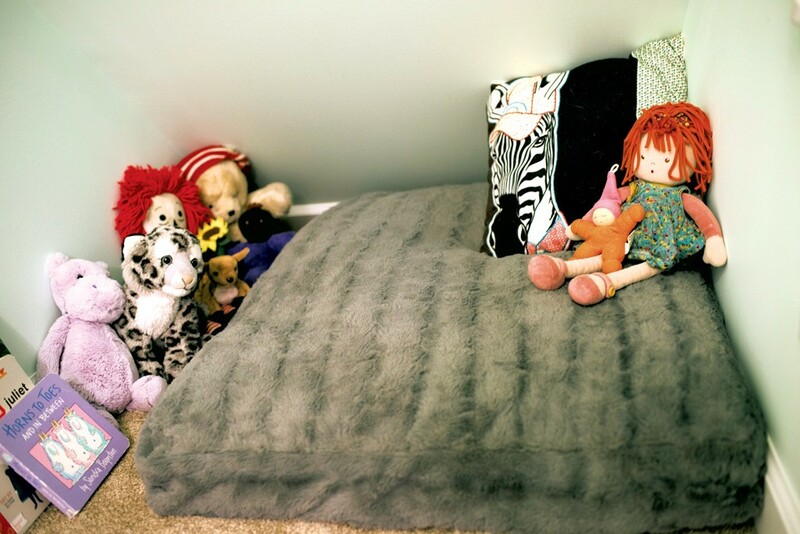 "It's amazing to see her growth and development through this playhouse." The family adds to the fun by decorating the dwelling for each holiday and season. It's currently decked out for spring with fake flowers, rain boots and little toy animals sitting in mini Adirondack chairs. Meghan says she hopes Hatley will be open to sharing the play space with her new sibling, due in June. "She's had friends come and play in it, and she's been good about sharing," Meghan said. If not, she adds with a laugh, "we'll have to build a little complex down there."